It wasn’t a blowout win Friday in Cleveland like last time for the Bulls, though it looked like it with a 112-91 final in which no Bulls starter scored in the fourth quarter and only Luol Deng played, albeit briefly. Deng had a season high 24 points and just his second game shooting better than 50 percent since he hurt his left wrist Jan. 21. Derrick Rose had an only-when-necessary 19 points and nine assists in just over 28 minutes while the reserves played well again with Ronnie Brewer with 13 points back to his bench energizer role and Kyle Korver with a three jamboree of a trio of three pointers in the second quarter to help the Bulls begin to open up the game. From there the Bulls effectively ended it in a sort of “I’ve had enough” quarter from Rose, playing a part in 22 of the Bulls’ 38 third quarter points with 10 points and six assists as the Bulls grabbed a 94-71 lead. It’s not like this was much of a statement type game other than saying it’s one you don’t want to lose or be tested that much with a tough opponent coming up Sunday in Philadephia. The Cavs were without injured center Anderson Varejao and star rookie point guard Kyrie Irving was out with the flu. So this was a game for the Bulls, who beat the Cavs in Cleveland by 39 in January without Rose, to not be overconfident. Which is hardly a worry with Tom Thibodeau as coach. It perhaps was only a matter of time as the Cavs got 22 points from Antawn Jamison and 16 from Ramon Sessions. There were few other places for them to go for offense in a game of attrition, in a sense, as the Cavs after hanging in down three midway in the second quarter couldn’t sustain much. So again the Bulls nudged past Miami to the best record in the Eastern Conference at 30-8 with Miami’s loss in Utah. As an aside, I happened to catch the end of it and there will be the usual discussion of LeBron James passing to Udonis Haslem for the last shot trailing by one. It failed. I was watching the Jazz TV broadcast, and even their announcers were rooting for him to take the shot. It’s making for an uncomfortable vote. How can you be MVP if you keep making what the apologists keep saying is the right basketball play and the least valuable. Magic Johnson was right on ESPN afterward. You take those shots, he said, in games like this so you are prepared when they matter in June. The irony is James was having a fabulous finish with all sorts of off balance and contested shots in the fourth quarter. It’s almost as if he now realizes everyone is demanding he do this and he’s not going to do anything anyone else ever tells him to do, sort of the way he ran the Cavs at one time. It does provide an opening of sorts for other teams as there has to be a disconnect with the Heat the way James continues to apparently fight against the demands of who others want him to be. So the Bulls move to 16-6 on the road, the best road record in the NBA with the most road games played. Their point differential, generally the guide of the top team, is No. 1 at 9.6 per game. They have yielded the second fewest points per game to the 76ers, who play somewhat slower. And the Bulls efficiency ratings of points per 100 possessions are in the top four in both offense and defense. So, yes they can, mister president. If no one is quite sure they will. For there were some flaws mixed in amidst the mostly impressive overall play Friday. The biggest positive, especially with an eye toward the post season, was the improving play of Richard Hamilton. Heck, it was just seeing him in uniform three straight games. In extending his minutes to 20, Hamilton was five of eight for 10 points and added three assists. He is a very savvy passer and immediately found Deng without hesitation for an early three as the defense shifted off one of his screens. Hamilton’s run the same plays for a decade and instinctively finds openings. Like Ray Allen and Reggie Miller, he is adept at not only getting over the screens, but playing off them and reversing when the defense collapses. He also identifies mismatches quickly, and when he got Sessions on a few early switches he went right into the post. That led to the defense coming down and Hamilton finding Deng again as Deng had 15 first quarter points and his own three jamboree with three triples. As for Hamilton, his return to the starting lineup with everyone healthy strengthens the bench and he continued to show positive signs he’ll move forward as the needed offensive threat. Joakim Noah had just six points and six rebounds with some foul trouble. But he came out fast again on the boards with four first quarter rebounds, all offensive in creating the second chances that got the Bulls ahead 30-28 after one quarter. The Cavs took a couple of small leads late in the quarter, though when they did Rose just took off and scored. He played at a mostly controlled pace Friday, though he had been looking forward to playing Irving, whom he admires. I liked that Thibodeau was using Rose with Deng more in that one/three pick and roll early, which helped Deng get going and get open shots. Deng’s a much better offensive threat than Noah, who usually sets those screens. Still, when Noah sets the screen, it takes a big man away from the basket. In those screens with Noah after halftime when the Bulls broke open the game Rose was able to slice through the Cavs defense for easy layups. One problem for Noah Friday was having to defend the more perimeter oriented Jamison. Because Carlos Boozer, who had a solid game with 13 points and 11 rebounds, is a weak defender, the Bulls generally have him defend the least offensive of the front line players. On Friday, it was Semih Erden and Tristan Thompson. So Noah spent a lot of time chasing Jamison on the perimeter. The conundrum for Thibodeau is Taj Gibson generally doesn’t add much offensively. So Thibodeau feels he has to play Boozer with Noah. And Noah does do some really good things on the perimeter. On one switch he got Sessions, who isolated but couldn’t get past Noah and settled for a long jumper that missed. But it also keeps Noah off the boards. While there is talk about Rose being in the post more as he talked about in the preseason, I’d like to see more of that one/four flat isolation for Rose as there’s no way he can be guarded one on one—and not by James, either—and then let him drive and pitch. Maybe Thibodeau is saving it for the playoffs. Why not at 30-8. Rose again was one of five on threes, the third straight game he was one of five. He’s shooting just 31 percent on the season on threes. But he’s really much better than that. If you watch at the end of quarters, Rose generally gets a half court shot when the Bulls have the ball. Most players in the NBA don’t want those half court heaves because of what it does to their shooting percentages. Rose got two more of them Friday. But Rose couldn’t care less about stats, making him further unique among his peers. Brewer seemed to be saving his energy more when he was starting for Hamilton. But back coming off the bench he made a couple of backcourt steals, surprising the Cavs and disrupting them as the Bulls began to take over in the second quarter. So is Korver, whose shots were going through without the net even moving. Though Boozer gets criticism for his defense, he does make some subtle moves on offense in interior screening from his Utah days. He made a nice seal of Korver’s man to get Korver wide open for one of his threes in the second. 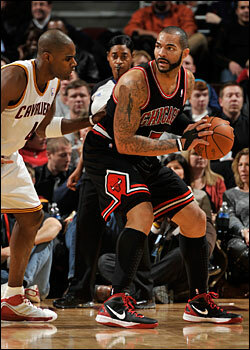 Then Boozer picked up a loose ball and found Korver sneaking to the line for another. Boozer also is excellent with the well timed push from behind, a staple of the Jazz offense. Then it was Rose taking over in the third quarter. He scored one inside on a nice seal of Sessions and pass from Deng. Otherwise, he just blew by the defense with that amazingly quick acceleration, going full court on drives several times through the entire Cavs team. On one runout after a steal, Noah made a heck of a catch behind his head from Rose and laid the ball in while going past the basket. Though Noah can look like the floppy scarecrow from Wizard of Oz at times, he really has impressive body control. Yes, you’d like to see him finish stronger with dunks at times in traffic, though that will take a bit more bulk than he has. Of course, maybe he doesn’t run the court like he does if he changes. The Bulls made it 94-71 after three and even got a Brian Scalabrine three to send the message to the long ago nation’s capital that the guys in red are coming. They were pretty red faced the last time in a 98-82 defeat in which they were badly overrun. “It should be fun,” said Rose. Those types of games are, especially as the playoffs get closer. This will be another rehearsal. And this time the Bulls are at full strength. It will be good to see what they bring.